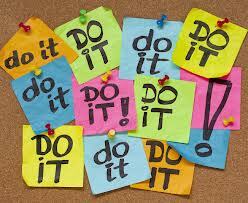 Stop Procrastinating – Just Do It! This blog was due last week. I can’t avoid it any more. It has reached the point on my To Do list where it is all alone and nothing can come before it. I’ve tried to make the stark words ‘do blog!’ more appealing with bright yellow highlighter and a delightful doodle all around it. An excellent 10 minutes had been spent browsing the net for images to illustrate it. If procrastination was a university course I would achieve an A+. It’s a while ago now, but as a student, I distinctly recall telling myself after each essay handed in with two minutes to spare that I would definitely start the next one earlier. Yet somehow that next essay never materialised ahead of time either. And that was without today’s on-call distractions of fast internet, Facebook, texts, tweets and Subway Surfer. So why do deadline pressured students continue to procrastinate and rely on the ubiquitous all-nighter? It’s the perfect excuse, but it appears they are made this way. It’s well documented by procrastination experts (check out these blogs if you need to wile away some time: The Procrastination Equation and Don’t Delay) that impulsiveness and a craving to do something fun rather than mundane are the traits largely to blame for our lack of self-control. Fear of failure, lack of immediate reward and disinterestedness are also contributors, and if you are one of those people who leave things till the minute because you work best under pressure, think again – apparently it’s the absolute relief that comes from having completed the task that is making you feel good, not the work itself. Oh and the part of your brain that controls will-power doesn’t fully develop until your mid twenties. So if you’re an impulsive, fun seeking individual in their late teens/early twenties, concerned about failure and keen on instant gratification you may as well give in to your inner procrastinator now. Or fight back! Just how do you prevent that quick Facebook check turning into an hour of You Tube viewing that you will never get back? 1. First get rid of the temptation. Create an ‘all work and no play’ zone such as your desk. This is the space where all focus is on the task at hand. Associate a separate place for fun and breaks. Work in bite-sized chunks. Make a deal with yourself to work solidly for 30 minutes and then have a break – you’ll be far more productive and efficient working to a reasonable time frame. 3. Use your university’s counselling resources. For students here at Victoria, the Student Counselling Service offers a workshop series Just Get it Done – Stop Procrastinating (Campus Connections 2013 see page 32) and Massey University has this self-help resource online. Right then, cup of tea before proof reading? Absolutely. Next Post Have you checked your Online Image?